For some of the best diving to be found in the area. 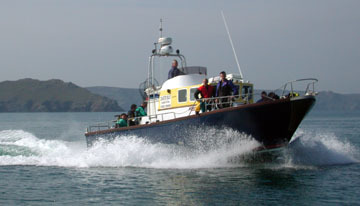 Twenty miles out to sea, west of Skomer Island you will find seals, wrecks and clear waters. Takes about an hour and a half in our high speed hard boat. Breakfast on the way across catching a few mackerel on the way. Slack water at the Smalls is 2 hour before H.W. Milford Haven and 5 hours after H.W. Milford Haven. 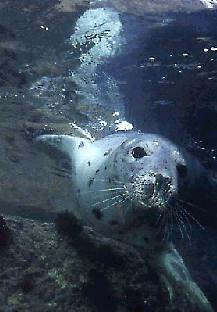 The area is famous for its marine life, including its Seals. Here they are tame enough to come right up to you and tend to play with your fins. 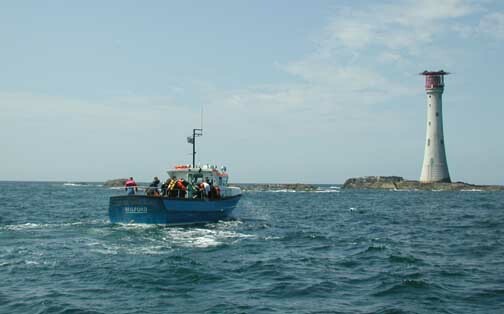 The visibility is always very good, with a varied marine life, probably the best in the area. This area is not very often dived, and a lot of it is still virgin country. There are many wrecks scattered around the cluster of islands, some waiting to be discovered. Visibility can be up to 25 metres. The Cambro wreck lies 150 meters due east of the Smalls lighthouse at a depth of 22m and is one of the many wrecks in this area. 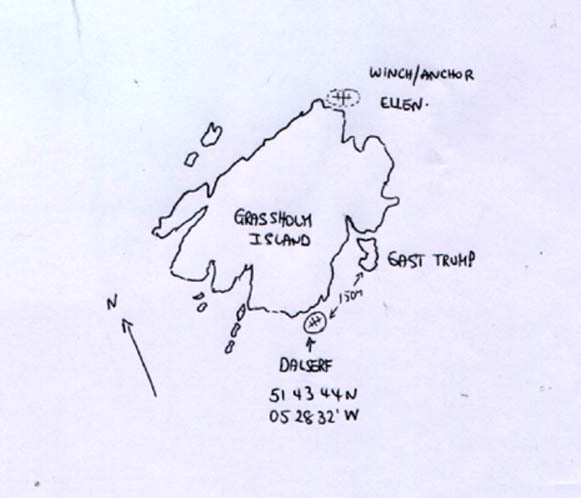 ( See wreck section) There is a restricted area at 51 43¬18"N 05 40`29"W, where an old Viking Sword was found, a Hiberno-Norse sword guard, dating to about AD1100 discovered by a sports diver in 1991. The restriction is 100m around the site. The Smalls can be reached from various launch sites. The best being Dale, Gelliswick, Martins Haven and Little Haven. Head due West from Skomer, passing Grassholm on the right. At LW the Hats and Barrels are a danger to shipping, as they can be seen just below the water line to the left hand side of Grassholm and the Smalls. Many a time the Little Haven lifeboat has been launched to come to the aid of divers who have run out of fuel on the way back. If the sea state increases, there are always problems getting back, so great care must be taken. The Smalls are also known for its seals, as they are lie all around the rocks. They are quite tame, not seeing many people, they become quite inquisitive and will follow you around under the water and play with your fins. You need to stay still in the water and wait for them to come up to you. They get so close you are even able to touch them. There are areas between the rocks where you can snorkel and you will be able to see the seals along the bottom looking up at you. An area 12 miles out from Skokholmn with 15,000 breeding pairs of Gannets. You will be able to smell the island from many miles away! Best dived on slack water. The Dalserf wreck lies on the south sid e and can be dived on a south flowing tide. Depths are 20 metres. Vis is very good around the island, up to 20 metres. On the south west side of the island you will find many seals, which can be quite playful at times. I have dived with them and had two trying to pull my fins off! Picked up a lobster in one of the gullies and had to fight to keep the seals from pinching it off me! The Ellen wreck lies on the north side of the Island and has some impressive boilers. A great place to be and what ever the tide there are always places to tuck in. 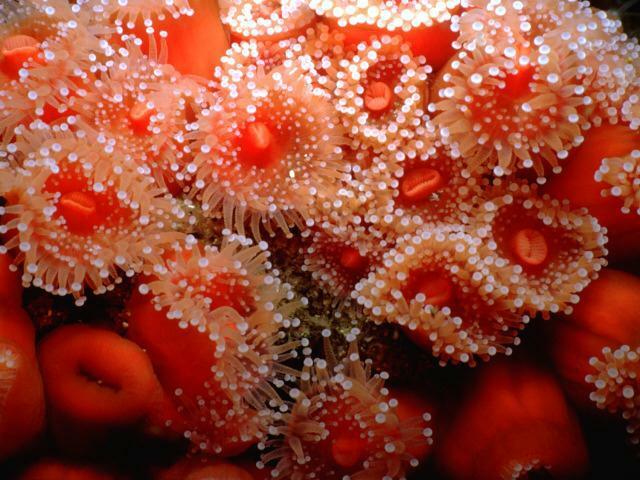 We cannot guarantee going to the Smalls, some dive charters will tell you they go there the first weekend of every month and then tell you at the last minute they cannot go because of the weather and take you somewhere else. We will know three days before when we get the weather update and if it is on then we will let you know then.